Properties for sale in Normandy, France - AHIN-SP-001110 Saint Louet sur Seulles 14310 Magnificent Manor House with business potential in 33 acres of gardens and woodland with indoor pool. Ideal as Hotel, Conference or Wedding Venue. AHIN-SP-001110 Saint Louet sur Seulles 14310 Magnificent Manor House with business potential in 33 acres of gardens and woodland with indoor pool. Ideal as Hotel, Conference or Wedding Venue. Tucked away in the hills of rural Normandy, the property is set in 33 acres of formal landscaped gardens, mature woodland and picturesque riverside walks. It has been recently run as a B&B and Cookery School and offers spacious, charming accommodation which is full of character. There are 9 en-suite bedrooms. For those wishing to maximise the potential of the property there is a huge stone barn and chapel which could be converted into additional accommodation, letting rooms or function rooms, subject to planning. The Old Bakery could also be completed and rented out as a self-contained unit. Viewing is highly recommended. 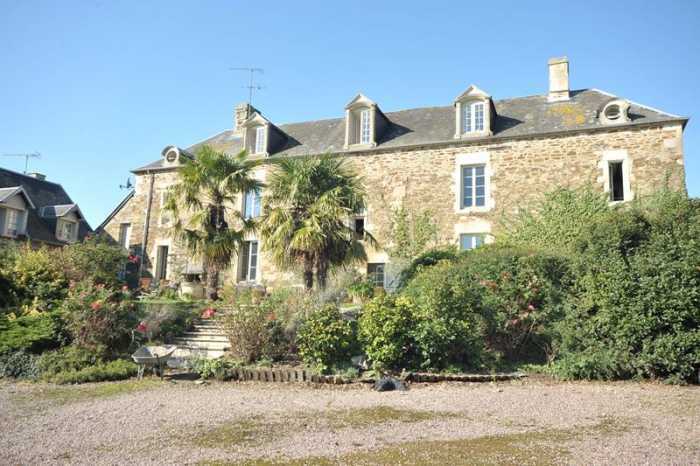 The property is located in Calvados in the Normandy region of France. The closest airport to is Deauville Airport (66 km). In the surrounding area are Dinard Airport (118 km), Rennes Airport (138 km), or Angers Airport (171 km). Within easy reach of the property there are numerous things to do such as as Bayeux Tapestry (Musée de la Tapisserie de Bayeux) (21 km), Memorial de Caen (26 km), D-Day Landing Beaches (33 km), or Coutances Cathedral (58 km). It is ideally situated in the heart of Bocage Normand, halfway between the D-Day Landing Beaches, Mont-St-Michel, Deauville, and Suisse Normande. It is a 20 minute drive to Caen which makes it easy for access to the cross channel ferries. Entrance Hall 6.06 x 3.89m Tiled floor. 2 radiators. Double doors to west elevation. Stairs to first floor. Lounge 5.87 x 5.75m Fireplace with wood-burner. Exposed beams. 2 radiators. Tiled floor. Window to east and west elevations. Room 1 6.74 x 4.86m Radiator. Tiled floor. 2 windows to east and glazed doors to west elevations. Exposed stone walls. Room 2 6.42 x 4.72m 2 windows to east and glazed door to north elevations. Tiled floor. Exposed stone walls. Stairs to loft over. Kitchen 6.00 x 3.50m Tiled floor. Window to south elevation. Range of matching base units. Tiled worktops and splash-backs. Built-in electric cooker and hob with extractor over. Fitted shelves. Space for free standing fridge/freezer. Glazed doors to east and west elevations. Landing Wood flooring. Window to front and rear elevations. Radiator. Bedroom 1/Family Room 5.98 x 4.96m Wood flooring. Window to front and rear elevations. 2 radiators. Ornamental fireplace. Exposed beams. Bedroom 2 3.12 x 2.78m Wood flooring. Radiator. Window to front elevation. En-Suite Bathroom 2.97 x 2.74m Walk-in shower. Claw foot roll top bath with mixer tap/shower fitment. Wood flooring. Window to rear elevation. Half tiled walls. WC. Hand basin. Heated towel rail. Vent. Owners' Bedroom 5.92 x 5.76m Wood flooring. Window to front and rear elevations. Exposed beams. Ornamental fireplace. 2 radiators. Dressing Room 2.60 x 2.20m Window to rear elevation. Radiator. Wood flooring. Exposed beams. Built-in wardrobes. Bathroom 2.93 x 2.74m Window to front elevation. Radiator. Fully tiled walls. Wood flooring. Walk-in shower. Claw foot roll top bath with mixer tap/shower fitment. WC. Hand basin. Heated towel rail. Vent. Landing 5.20 x 3.85m Window to front and rear elevations. 2 radiators. Exposed “A” frame and stone wall. En-Suite Bathroom 5.20 x 2.04m Bath with mixer tap/shower fitment. WC. Twin vanity unit. Tiled floor and partly tiled walls. Shower. Radiator. Built-in wardrobe with mirror fronted sliding doors. Window to rear elevation. En-Suite Bathroom 5.20 x 2.53m Bath with mixer tap/shower fitment. Twin vanity unit. WC. Tiled floor and partly tiled walls. Shower. Radiator. Window to rear elevation. Built-in wardrobe with sliding mirror fronted doors. Kitchen/Dining Room 6.07 x 5.79m Tiled floor. Partly glazed door and side panel to north elevation. Ceramic sink with mixer tap. Open fireplace with raised hearth. Space for range style cooker with extractor over. 2 radiators. Base units. Preparation sink and double ceramic sink. Vent. Inset spotlights. Door to rear hall and outside freezer room. Laundry Room Tiled floor. Space and plumbing for washing machine. Inner Hall Exposed stone wall. Tiled floor. Radiator. Wine Cellar. Inner Hall - Tiled floor. Ladies and Gents cloakrooms - tiled floor and WCs. Indoor Swimming Pool, Sauna and Wet Room 7.9 x 5.72m (min). Electrically heated swimming pool with Jacuzzi and wave machine. Inset spotlights. Tiled floor. 3 radiators. . Sliding patio doors to terraced area. Seating/Reading Area 6.11 x 3.03m Partly glazed door and side panel to north elevation. Exposed stone wall. Radiator. En-suite Bathroom Velux window. Sloping ceiling. Tiled floor and partly tiled walls. Bath with mixer tap/shower fitment. Vanity unit with mirror and light over. Radiator. Vent. En-Suite Bathroom Bath with mixer tap/shower fitment and tiled surround. Vanity unit with mirror and light over. Vent. Children’s Bedroom Sleeping platform. Exposed “A” frame. Radiator. Second Landing Velux window to south elevation. Built-in cupboards. En-Suite Bathroom Partly tiled walls. Tiled floor. Vanity unit with mirror and light over. Radiator. WC. Bath with mixer tap/shower fitment. Window to north elevation. En-Suite Bathroom Tiled floor and partly tiled walls. Radiator. WC. Vanity unit with mirror and light over. Bath with mixer tap/shower fitment. Tiled floor. Window to north elevation. A long tree lined gravel drive from road leads to a large parking and turning area. The garden on either side of the drive is laid to lawn with mature trees and hedges. The majority of the land is used as paddocks and there is approximately 7 acres of woodland. 2 stables. There is a river with brown trout. Orchard. Vegetable garden. To the rear of the property is a delightful stone terrace withwell and barbecue area and mature trees, shrubs and flower borders overlooking the lawn. There is a huge Barn 53.00 x 6.95m Constructed of stone under synthetic slate roof with power and water. Block and beam floors to first floor loft storage area and part used as Chapel. Small stabling area. Pig sties. Living Room 4.06 x 3.98m Open fire. Hot water cylinder. Spiral stairs to first floor. Convector heater. Tiled floor. Glazed door to east and south elevations. Bedroom and Bathroom to finish. Attached Open Fronted Car Port. Mains water, telephone and electricity are connected. Drainage is to an all water septic tank. Oil fired central heating. 3 open fires and 2 woodburners. Broadband internet connection. Please note : There is no Energy Rating for this property because the owners do not have the last 3 years' energy bills for full time occupation.